The general opinion in this country regarding mushrooms has been, that with one or two exceptions, all forms of fungus growth are either poisonous or unwholesome, but it is very gratifying to observe the change that is rapidly taking place in the public mind. Soon public opinion will acknowledge that it is an established fact that the great majority of the larger funguses, especially of those that grow in fields and other open places, is not only wholesome but highly nutritious. What Kate says may be true, however I don’t recommend that you eat any wild mushrooms without first knowing exactly what they are. Better yet, stick to the ones sold at the grocery store, unless you’re friends with a foraging expert (mistakes can happen!). In this recipe, mushrooms are the magic ingredient. 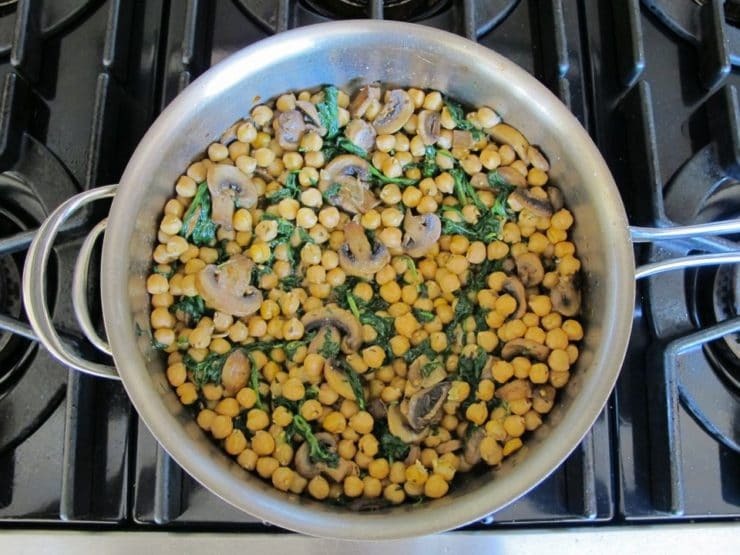 I make this super simple vegan Chickpea, Spinach and Mushroom Sauté once or twice a week for my husband. It’s one of his favorites. 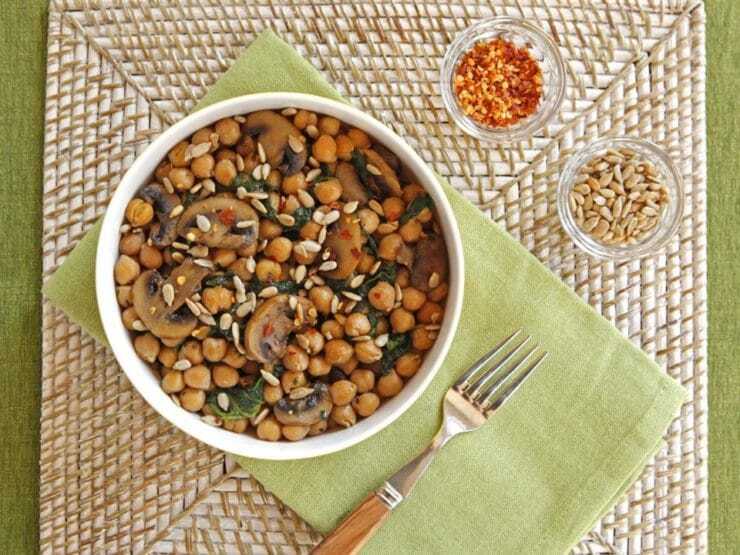 The seared mushrooms, seasoned with garlic and spices, taste almost meaty when combined with the nutty chickpeas and steamed spinach. It’s a homey, comforting sort of dish with no grains and a fairly low glycemic index. I find this recipe to be very nourishing, what we like to call “clean eating.” It’s Mediterranean-inspired, low in calories, loaded with fiber and heart-healthy. Don’t skimp on the olive oil, it adds a lot of flavor. We consider it a one-pot meal; it satisfies as either a lunch or a dinner. I’ve also served this as a side dish to rave reviews from family and friends. The sprinkle of roasted sunflower seeds gives it a lovely crunch. It may not be the prettiest dish, but it’s certainly one of the yummiest. No need to go foraging, common white mushrooms will do just fine. I think Kate Sargeant would approve. Heat olive oil in a sauté pan over medium till hot but not smoking. 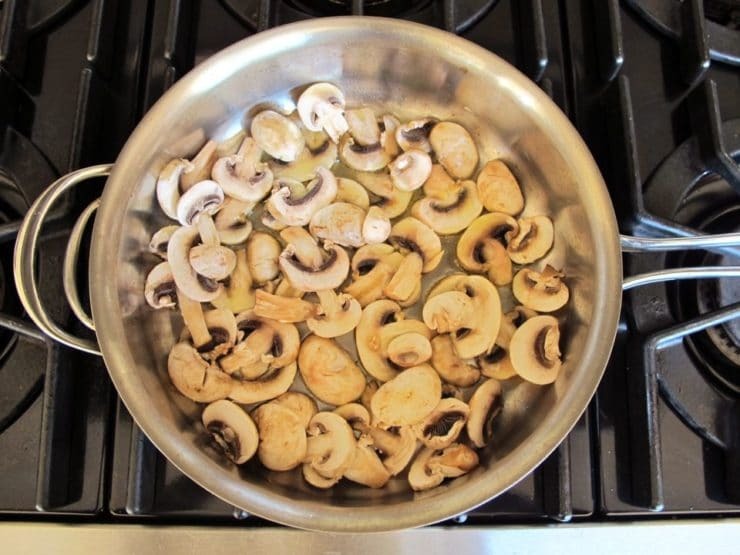 Place the mushroom slices into the pan. Let them fry undisturbed for 3 minutes. 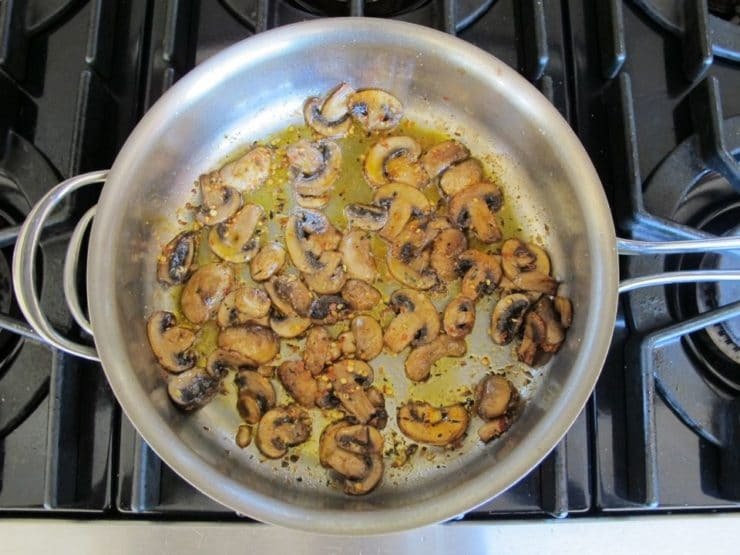 Stir and continue frying till the mushrooms are golden brown. Season with salt and pepper. Add the red pepper flakes, basil, and paprika. If spice sensitive, start with just 1/4 tsp of crushed red pepper-- you can always add more to taste later. I like it with a kick, so I add 1/2 tsp. Stir seasonings to coat the mushrooms. Add the garlic last. Stir and cook for 1 minute till fragrant. Stir in the chickpeas till all ingredients are well combined. Let the chickpeas heat up for 2 minutes, stirring as they warm. Pour 2 tbsp water into the bean and mushroom mixture and bring to a boil. Meanwhile, place the fresh spinach or baby kale over the top of the chickpeas. It will seem like a lot of greens at first, but they will shrink up a lot as they cook. Reduce heat to medium low. 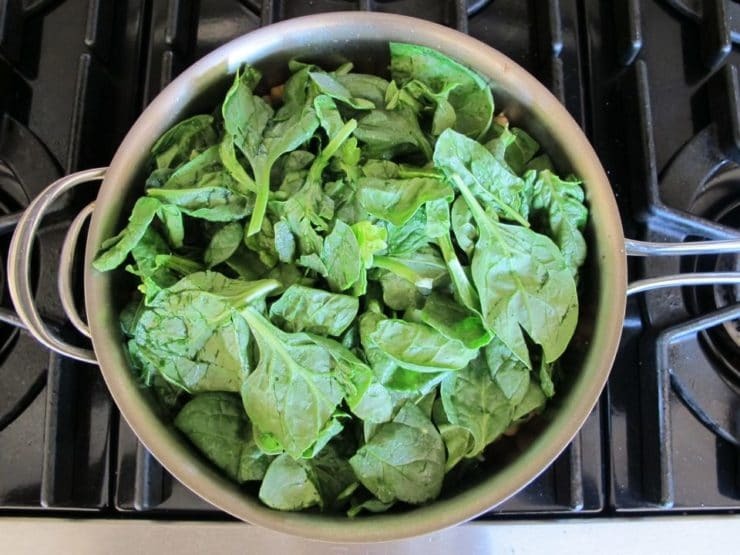 Cover the pan and allow spinach to cook over medium heat for about 5 minutes, or until wilted. 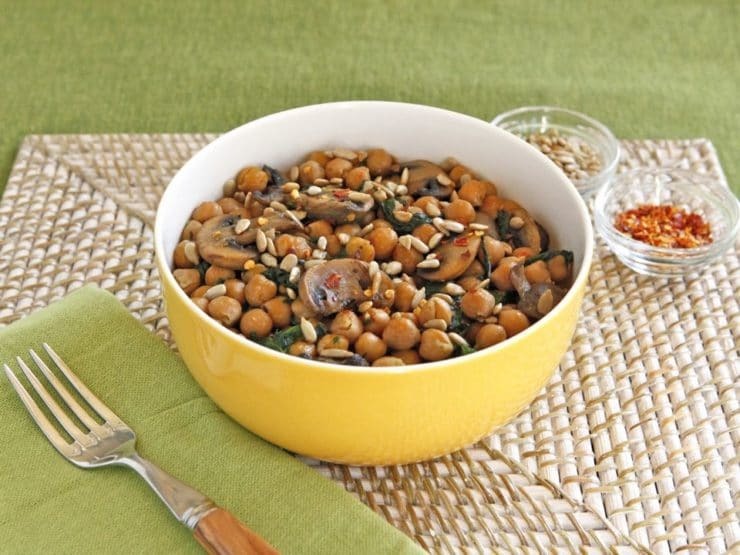 Stir the spinach into the chickpeas and mushrooms. Season with salt and pepper to taste (I usually use about 1/4 tsp of salt and a large pinch of pepper). Turn heat to medium and let the mixture continue to cook till excess liquid has evaporated. Sprinkle with roasted sunflower seeds (optional) and serve. I serve chili pepper flakes on the side for my family so they can spice it more to taste, if desired. So delicious! I’m new to cooking, and even newer to vegetarian cooking. My husband and I decided to go vegetarian for health reasons, which was exciting but also kinda scary. My husband loves food, but in general he does not love my food..haha 😛 I was worried that going vegetarian would be miserable for him as I have no idea how to make vegetables taste good. But this recipe gives me hope! It was so simple, quick and tasty.. I’ll be making it a lot more in the future! Thank you! So glad you like it Rebecca! Tori, could you include the nutritional information with your recipes (e.g., calories, carbs, fat, fiber, etc.)? Hi Kathy, I don’t currently offer calorie breakdowns on my recipes. The nutrition calculators available online are not always reliable, and nutrition stats of various ingredients can vary from brand to brand (sodium content, calories, etc.). There are calorie calculators online you can use where you can plug in the specific brands you use. Just Google “calorie calculator” and you should get many results. This was very tasty and easy! It strikes me that it would be wonderful with some Indian spices. What do you think, and do you have suggestions? How do you think this would be if served cold or at room temperature for a Shabbes lunch. Hi Mary, I’ve never served this one cold but I think it’s probably a lot better warm. It’s less a salad and more of a stew. That said, it might work, I just haven’t eaten it cold before. If you try it let me know what you think! Oh. My. Goodness. Was this dish good! I just made it tonight for my family and my husband requested this dish once a week and my 6 year old daughter gobbled it up. I added fresh Kale and used pine nuts tonight instead of the sunflower seeds, which I’ll for sure try the next time I make it. I am SO glad I found you! I am from Los Angeles and adore falafel, but moved to a small town in North Carolina 2 years ago and haven’t had a good falafel since. That’s how I found you. I am soaking my dried chickpeas now for Falafel Night tomorrow. I’ll let you know how they turn out. I can’t wait to try more of your recipes as I love Israeli and Lebanese food more than anything and not much of that here in the South. I miss all my Jewish friend’s back home. Hi Tori, so I made the falafel tonight and they were the BEST I ever tasted. Seriously. Your recipe is perfect but I did add the egg right at the get go for assurance it would stick AND I added the baking soda and I love the fluffiness of the center juxtaposed to the crispy crust. Oh my! I’m addicted. Thank you so much. I do have a couple questions: what method do you use to add the falafel to the boiling oil, and do you save your oil for the next time you make falafel? My Lebanese neighbor always saved her oil, curious as to what you do. I also made your Tahini dressing but I made my own hummus and I make Tabbouleh with quinoa to cut down on gluten in my life. SO delish. Thanks again. That’s what I like to hear!! Thanks for writing back Michelle! I’m going to do this for Shabbat dinner tonight. I am going to add asparagus and serve over kasha. I will coat the kasha kernels with egg and toast them and then add organic chicken broth. I made the chickpea/spinach/mushroom stew – used kale instead of spinach since it came in csa bag. EXCELLENT! And the leftovers were great reheated, a few days later. Just added some fresh chopped spinach & some more sliced mushrooms, covered in a Corningware dish & nuked for a few minutes. I made this last night for dinner. It is delicious! I am having it for dinner again tonight but I added a bit of cubed baked sweet potato and some chili garlic sauce. Yum! You are right about how wonderfully versatile this is. Margie, and I will try cumin & coriander next time! Great ideas! I made something like this the other night — minus the mushrooms and with spinach rather than kale. Used tons of garlic and cumin instead of the seasonings you suggest. Now I´m excited to try it with your suggested seasonings! You know it, Tori. This recipe opened up a whole new way for me to have super high-calcium greens. I’ll report in on what other tweaks I do in the future! a few leaves of basil from a plant I got as a favor at a wedding shower! This represents probably 3 meals for me. IT’S FABULOUS. Thank you so much for the inspiration, Tori!!!! I also threw in maybe 1/4 cup of unroasted sesame seeds and topped the serving bowl with avocado. I am stuffed and have so much left! What a great thing to do with greens. Thank you so much again for your wonderful ideas and site! 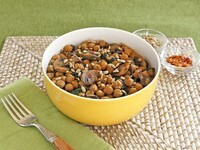 I think I might try pine nuts/piñon/pignoli instead of sunflower seeds. 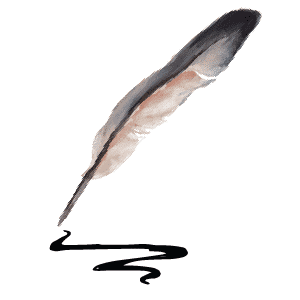 On the list. Think I have all the ingredients in house! 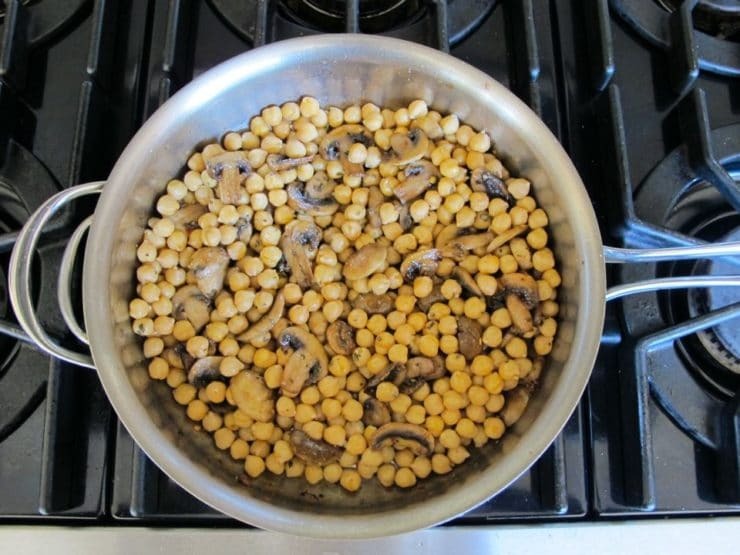 I love chickpeas, spinch and mushroom. That´s a fantastic idea! Thank you! Is there something that can be used instead of or replace the mushrooms? this sounds good! can it be served cold? Hi Sara, I would not recommend serving it cold; it is really best as a warm dish. I´m going to try this!!!! Got sunflower seeds of my own coming on!